Welcome to Festival of the Trees #33. It has been a pleasure to read all the submissions and create a narrative structure for them. Thank you to FOTT's Dave Bonta, the contributers to #33, and FOTT readers. One of my favorite trees, the tulip poplar or tulip tree, is the subject of M.A. Sheehan's first contribution to FOTT. Sheehan is the author of A Year in the Yard and writes about the yard growing around him her as she watched the tulip poplar she inherited with his her yard. Her His tale of one tulip poplar that was eventually joined by 59 more as well as smartweed, cinquefoil, partridgeberry, bluets, asters, maples, sweet gums, black gums, viburnums, "seventeen hollies, one hackberry, two beeches, [and] a perfect baby dogwood is not a happy one. It's too painful to tell the ending here. Read the full story for yourself. By the way, Sheehan's essay was previously published in the February/March 2009 issue of the Audubon Naturalist News. Sheehan's story ends with loss and hope for regeneration. The latter is what should happen in a prescribed burn area in Big Cypress National Preserve photographed by Robert Sobczak of The South Florida Watershed Journal (SFWJ). (More images of Big Cypress National Preserve can be seen here.) Another set of beautiful photographs and diagrams of water levels in a cypress forest are the subject of another SFWJ post, Dry season bailout. More specifically, Robert's photo-essay illustrates "how winter dry down of water levels factor into how [cypresses] hold water." Observer of "the woods and wetlands of northeastern North Carolina," swamp4me, rambles in Millpond and sees a beech, a "scrappy little tupelo gum," a red-backed salamander, and more. There were days I sat curled in Old Maple’s branches and sobbed over some childhood injustice: the day our dog, curly, died, the day my mother went into the hospital and I thought she’d never return, the day the little girl up the street drowned. Sometimes I hid between its leafy branches and ate my summer sandwiches, just to escape cleaning out the attic or garage. That elegant maple withstood years of little hands and feet clinging and climbing to its sturdy branches, right up until I left home at eighteen. Conifers are the subject of several posts. A photograph of the moss covered bark of a Scot's Pine from Seurasaari, western Helsinki, Finland is at GrrlScientist while Ash of treeblog takes us on "a walk down Ewden" and gives us peeks at the Sitka spruce, larch, and pine of Broomhead Reservoir. Tai Haku at Earth, Wind & Water proudly gives us giant redwoods photographed in the Giant Forest Grove, Sequoia National Park. Broadleaf trees make a showing too. 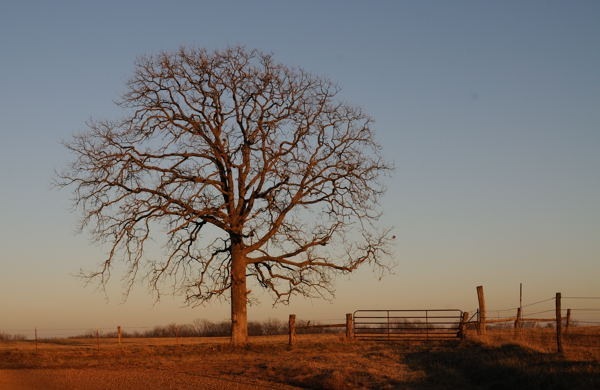 Laura Phillips of The Land of Moo shares a photograph of a white oak taken in "the evening light, when the skies are clear, shines a rich, amber gold light across the fields in the moments before the sun sinks below the western horizon." Did you know there is such a plant as an Aster Tree? Neither did Mary of A Neotropical Savanna. Palo blanco (Vernonanthura patens), a Panamanian tree (or shrub) is in the Asteraceae family. Mary has a palo blanco in her front yard. Another did you know: After the hazelnut is pollinated, "fertilization is delayed for several months, during which the incomplete female flower develops further." This factoid comes from Hugh of Rock Paper Lizard. He spent some quality time with a hazelnut after noticing its flowers while locking his bicycle to its trunk. A broadleaf it is, but the Manitoba maple (Acer negundo), also known as box elder, deserves its own paragraph. It accomplishes quite a bit according to Sheri Leckie of Willow House Chronicles. The tree prevents bank erosion and shades the waterways along which it grows. It also prevents prairie soil erosion and blocks the wind; early settlers used it in windbreaks or shelterbelts. These shelterbelts are useful in another way: recently, they "have been evaluated as important carbon sinks." Maple syrup via its sap is another benefit of the Manitoba maple. But all good things have detractors. Sheri notes that the maple has been characterized as a "junk tree." The fourth Field Trip started at GR NZ075376, on the OS Explorer Map OL31, North Pennines, and was conducted over a distance of about 7.5 miles, in the area around Waskerley Beck and Tunstall Reservoir, near Wolsingham. It was moist air, very cold at times, with the occasional snow flurry and vicious pelting of small, stinging hard ice balls. The details do not end there. Lists of flora and fauna are provided as well. The walkers saw among other plants and animals, Pied Wagtail ("wagging"), Wych elm (a new common name for me) (Ulmus glabra), Bird cherry (Prunus padus), and Rowan (Sorbus aucuparia). Sharron Lea also mentions deer but no beetles. But Ted C. MacRae of Beetles in the Bush has these insects covered. Cleverly, Ted writes of "several rarely encountered species of woodboring beetles" by way of the host trees that support them: river birch (Betula nigra), common alder/ hazel alder/ smooth alder/ tag alder (Alnus serrulata), blue beech/ hornbeam/ musclewood (Carpinus caroliniana), and hop hornbean/ American hornbeam (Ostrya virginiana). 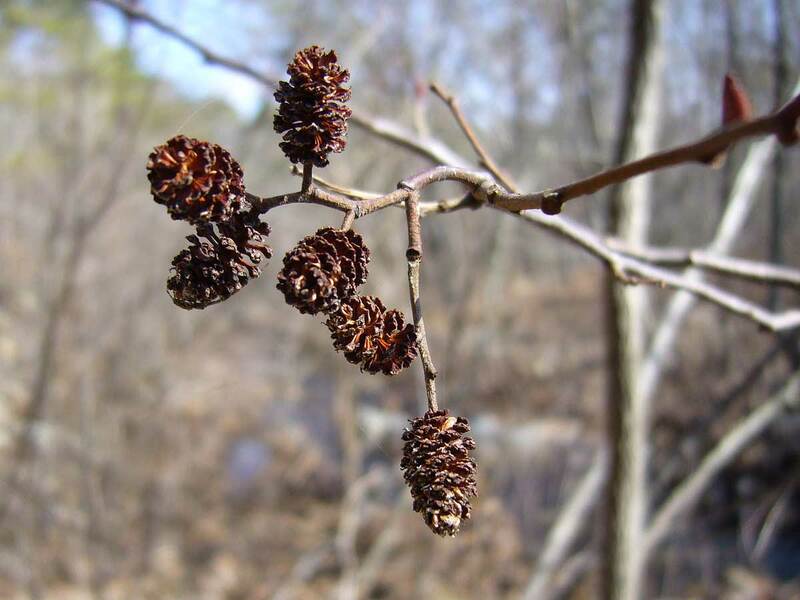 The river birch is one of five native birches in Missouri and Pickle Creek is "a betulaceous 'hot spot'." What great terminology! Back to the beetles (and their trees). Ted has collected jewel beetles from the river birch. In fact, he discovered a new species - "a small jewel beetle...named Agrilus betulanigrae in reference to its (then) only known host...." The longhorned beetle, Saperda obliqua, associates with the common alder; another longhorned beetle, Trachysida mutabilis, with the blue beech; and finally, the jewel beetle, Agrilus champlaini, with the hop hornbeam. Can living trees maintain themselves without contributions from the dead? I guess our “urban forest” has survived for almost a hundred years — but what about the next hundred, and the next? Eric raised some interesting issues in an email to me like nature-deficit disorder, the "spare parts" playground movement, and large urban parks as reservoirs for tree diseases and pests like Emerald Ash Borer. Aside from diseases and infestations, other natural phenomena can greatly impact trees. With a single photograph, Wren (of the aptly named Wrenaissance) shows trees damaged by earthquake. Vicky Sawyer of TGAW asks, "Have FOTT readers spotted any Silo Trees?" If so, please contact her. What are silo trees? Well, simply stated, they are trees growing in and out of farm silos. Vicky's 31 tree photographs are arranged by U.S. states (17 so far). It's difficult to choose a favorite, but I do prefer the Silo Tree from Michigan. It reminds me of Martin Puryear's "Untitled" (stone) at Oliver Ranch in Alexander Valley, California. We go from the woodland of Columbus Park in Chicago, Illinois and farm silo trees to the desert of Sudan where Jeremy of Agricultural Biodiversity Weblog gives us a "jaw dropping" aerial photograph of 40-year old, large trees. How do these trees thrive in the desert? Jeremy turned to John Greenfield who explained the concept of "'linear farms' behind vetiver hedges," or "a farm 10m wide X 1000m along the hedge equals 1 ha." Basically, depressions were created to hold rainfall in contrast to what usually happens to rainfall in the desert: a crust forms on top of the soil and the rain runs off (sounds like the impervious surfaces of so many of our cities). Several of the contributors wrote about real animals but Birder's Lounge's Amber Coakley shared photographs of tree branches that resemble animals, like the pelican in the mountains of Denver. Amber and Global Swarming Honeybees blogger Gerry Gomez Pearlberg were thinking along the same lines. Gerry has photographs of trees with faces or what she terms "facially-inclined tree front[s]." 20 years of Chico Mendes's death "At first I thought you were fighting to save rubber trees, then I thought I was fighting to save the Amazon rainforest. Now, I understand that I am fighting for humanity." Another international blogger, Maneesh of AdmirableIndia.com, takes us to see a betel nut tree, but first we cross Mathoor Hanging Bridge in Kanyakumari. (Read another installation of Maneesh's trip to Kanyakumari here.) Also, read about the human-flower betel nut connection at Human Flower Project. Its trunk height is 17.7 meters, while the total height being 51.5 meters. Trunk girth is 13.8 meters and the trunk volume is 244.5 cubic meters! The age of this tree is difficult to estimate, but there are hypotheses that its age is about 2000 years! Giant trees can be found stateside, too. Prem Subrahmanyam "came upon some majestic old Live Oak and Baldcypress trees" on Flagler Trail near Geneva, Florida. See the "festooned with mosses" trees at Florida's Native Orchids. At the beginning of this essay, I mentioned that one of my favorite trees is the tulip poplar. The live oak is one of Tidewater Gardener Les's favorite trees and he specifically wrote about the Emancipation Oak in Hampton, Virginia for this festival. I like live oaks, too. Anyway, this particular oak is quite significant in (African-) American history. Beneath its shade, slaves were taught to read and write by Mary Smith Peake ("a free woman of color") and "in 1863 newly freed African Americans heard the first reading in the South of Abraham Lincoln's Emancipation Proclamation." Next month’s Festival will be hosted by Seabrooke at The Marvelous in Nature. Please send your submissions to sanderling [at] symbiotic [dot] ca, or use the online submission form. The deadline is the March 30, 2009. What a great write-up of what looks to be a fantastic line up. Looks like I've got some reading to do. Great job hosting the festival. I enoyed skimming it over and look forward to a more quiet time to go back and read iit indepth. Love those silo trees! Who'd have thought? Oh crumb, I had meant to submit but forgot. You did a great job putting it all together. I can't wait to go back and look at more links later. Trees rock! And I heart nurse logs too, just like you. Thank you for this beautiful celebration of trees. I love the tree silos. I had never heard of such a thing before and it was hard to picture them without the picture, so... thanks! Pleased that you are enjoying Festival 33 and hope you'll continue to visit the blogs/ websites of the contributors as well as this blog. Thanks again. I look forward to exploring all this more fully, and posting to my FB page and blog. Pardon me for forgetting my manners and not thanking you sooner. This was a wonderful endeavor and I enjoyed being part of it. Thank you for placing the link on the post, remembering the death of a very worthy man who fought to preserve the trees of the forest. We should never forget those who have fought so much and contributed enormously to preserving the environment. I would just like to make a small correction, should anyone wish to translate for an on-line system, that the blog is written in Portuguese. Cesar: obrigado por ter aceite as minhas desculpas. My apologies for other errors in the post. Saw several reference to redwoods. I've posted the link quite a few places for anyone who is interested to see what those trees look like. Also mentioned in The Wild Trees book listed. Thanks so much for putting this together. Wonderful job, as so many others have said! This is a truly great festival and I am learning so much from reading it. Thank you for all your hard work and dedication. I am so delighted to be included - and think the Michigan Silo Tree is astounding. Yes, trees are wonderful. Hey!! Nice lovely trees. You have done a real great job. After seeing this I am planning to make a short documentary on the festival. Tulip poplars are real beauty. I really like festivel of the tree 33! You put your effort to assemble all info and that’s great. Wow... this is a great festival. I love the tree. After seeing this I am so impressed and truly see it as a labor of love. Really tree festival 33 is wonderful. You have done a great job. Yes I really like festivel of the tree 33. thank you for posting and sharing it. and this seems a like a great wee festival. I loved your post so thanks for writing about it.